Veteran Coaches Owen Da Gama and Pitso Mosimane expressed their disappointment at Chippa United for sacking Dan Malesela after just three games. Malesela was fired by Chippa on Tuesday night and has since been replaced by Eric Tinkler. 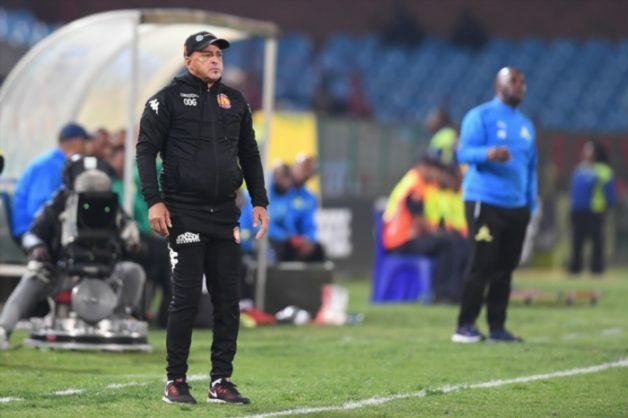 “Well‚ I’m not at liberty to speak about other teams and I think it’s wrong‚ but I just think it’s a shame when coaches are not given enough time to settle down and to make sure their players understand the game plan‚” Da Gama told the media. “But‚ you know‚ you’ve got to understand the nature of any team when you go work for them. There are other teams that I will never go work for them – I won’t. “I don’t fear [for my job] because I work for a very good team. I work for people who respect me and I work for people who respect coaches. Mosimane also believes coaches should be given more time to build a team that can compete. “One of the black coaches is gone‚ hey. I spoke about it remember. Yeah‚ shame‚ it’s sad‚ but are you surprised with Chippa? There’s no news there guys‚” said Mosimane after his 10-men side drew with Highlands Park.